San Gold Corporation (TSX:SGR)(OTCQX:SGRCF) ("San Gold") is pleased to report that it has entered into an option agreement (the "Agreement") with the Canadian Arrow Mines Ltd. (TSX VENTURE:CRO) ("Canadian Arrow") properties located northeast of Rainy River, Ontario. The Agreement gives San Gold an 80% undivided interest in all precious metals including, but not limited to, gold and silver but specifically excluding platinum and palladium (the "Precious Metals"), contained on Canadian Arrow's current properties. The rights to all other mineral resources including, but not restricted to, base metals, platinum and palladium remains with Canadian Arrow. "This is an outstanding land package that we've been able to establish in the Rainy River area. This Agreement, in conjunction with the contract recently signed with Opawica, secures a proven gold property along with the main structural features associated with that deposit," said George Pirie, San Gold's President and Chief Executive Officer. On June 19, 2012, San Gold announced a separate transaction to purchase three properties from Opawica Explorations Inc., including the Whitesides-Carscallen property and the Golden property, which are both located in the West Timmins gold camp, Ontario, and the Atikwa Lake property, which is located adjacent to the properties covered in this Agreement. Additionally, Canadian Arrow has extensive holdings in the Timmins area covered by this agreement. Figure 1 at the end of this release shows the location of the Canadian Arrow and Opawica Exploration properties in relation to regional geology. Figure 2 shows the location of the Atikwa Lake Project in relation to Rainy River and Kenora. To maintain the Agreement in good standing and earn an 80% interest in the Precious Metals contained on the properties, San Gold has agreed to, among other things, purchase 5,000,000 units of Canadian Arrow at a price of $0.10 per unit. Each unit will be comprised of one common share in the capital of Canadian Arrow and a half of one share purchase warrant. 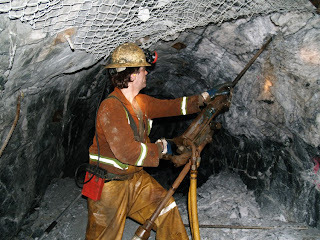 Each full warrant will entitle San Gold to purchase one common share in the capital of Canadian Arrow for an exercise price of $0.20 for a period up to two years from the date of the issuance of the warrant. In addition San Gold is also required to incur an aggregate $1,500,000 in expenditures on the properties graduated over four years from the date of execution of the Agreement. Upon completion of San Gold's obligations under the Agreement, San Gold will earn an 80% interest in all Precious Metals contained on the properties and a joint venture will be formed between San Gold and Canadian Arrow. Initial ownership in the joint venture will be San Gold 80% and Canadian Arrow 20%. San Gold is an established Canadian gold producer, explorer, and developer that owns and operates the Hinge, 007, and Rice Lake mines near Bissett, Manitoba. San Gold employs more than 400 people and is committed to the highest standards of safety and environmental stewardship. San Gold is listed on the Toronto Stock Exchange under the symbol "SGR" and on the OTCQX under the symbol "SGRCF". San Gold Acquires Mineral Claims from Strikepoint Gold Inc.
San Gold Updates Mineral Resource and Mineral Reserve Estimate to 3.5 million oz.